Tokyo -- Coordinated by ANEW Holdings Inc., the 3rd Summit of the Bengaluru Tokyo Technology Initiative (BTTI), hosted by Japan External Trade Organization (JETRO) in association with the global think tank Carnegie India, and Indian Commerce and Industry Association Japan (ICIJ) was held on October 15th, 2018 at the Sasakawa Peace Foundation headquarters in Tokyo. 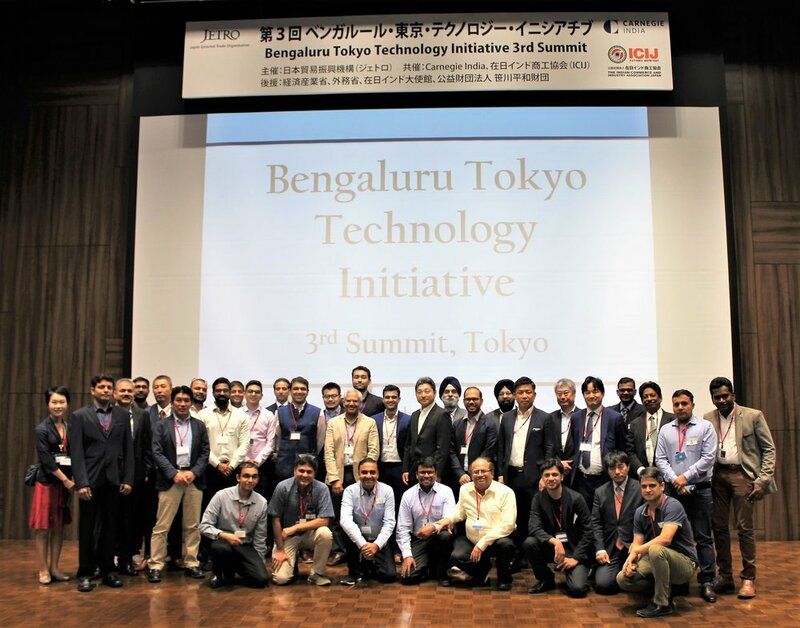 Based in Bengaluru and Tokyo, BTTI facilitates the exchange and transfer of technology between India and Japan, hosting a place for members of the public, commercial and academic sectors of both nations to convene. The inaugural event was held in Bengaluru in December 2017 co-hosted by Carnegie India and the Embassy of Japan in India. The event aimed to be a closed space for experts from Japan and India to come together and engage in active discussions regarding the advancement of collaboration in technology between Japan and India. In addition to a roundtable discussion was a networking session for Japanese venture capital firms and Indian startups. At the 3rd BTTI summit, Carnegie India’s R.K. Misra chaired two panel discussions, where panel members engaged audiences with their insights on the advancement of India-Japan relations. Following the panel discussion, a pitch session was held where 13 startups from India took to the stage to share their business ventures with the Japanese companies in attendance. In addition, a business matching session between the Indian startups and the Japanese companies took place, creating a unique opportunity for members of the two countries to come together and engage on an enterprise level. A total of 145 attendees from startups, entrepreneurs, industry leaders, government and academia were present. Upon Indian Prime Minister Narendra Modi’s state visit to Japan on October 28 to 29, 2018, the prime minister met with Japanese Prime Minister Shinzo Abe where the two parties held an official Japan-India annual Summit. Regarding his visit, Prime Minister Modi stated that “We have a special strategic and global partnership. Our ties with Japan, both economic and strategic, stand completely transformed in recent years,” emphasizing that Japan was India’s “valued partner.” Both Japanese and Indian governments have agreed to move ahead with promoting collaboration between start-ups and exchange of skilled IT human resources, as well as joint research and development in the field of AI, under the Japan-India Partnership in the Digital Industry. BTTI looks forward to the furtherance of business partnership in technology, recruitment, and funding opportunities between the two countries, in addition to promoting the continued friendship of India and Japan. Manji Suzuki, Vice President, Innovation, DENSO International America Inc.
Tsuyoshi Hoshina, General Partner, Canal Ventures, Ltd.
Yuji Fujinaga, CEO, ANEW Holdings Inc.
Tomoyuki Nii, Executive Officer, SBI Investment Co., Ltd. ANEW Holdings is a global incubation and venture advisory group providing financial and business support to both domestic and overseas companies for the development of new business and promotion of strategy. Focus areas include platform models, consumer goods, media & entertainment and technologies. Headquarters in Chiyoda-ku, Tokyo, ANEW Holdings is represented by CEO Yuji Fujinaga and COO Wataru Ito. The company’s U.S. office is located in Los Angeles, California, and its India office is in Bengaluru, Karnataka.